Professor and playwright Ishmael Reed has turned his criticism of “Hamilton” into his own play, titled “The Haunting of Lin-Manuel Miranda,” which highlights Alexander Hamilton’s “complicity in slavery and his war on Native Americans,” The Associated Press reported. “My goal is that this be a counter-narrative to the text that has been distributed to thousands of students throughout the country,” said Mr. Reed, who teaches at the California College of the Arts and the University of California at Berkeley. According to the AP, professors from “Harvard to the University of Houston to Rutgers” are “incensed” by Mr. Miranda’s glowing portrayal of Hamilton, who celebrates open borders and denounces slavery in the play. A publicist for “Hamilton” and Mr. Miranda declined to comment for the AP story, but the playwright has stated in the past that his musical is a work of historical fiction. An immersive exhibit of the play to open in Chicago this fall will also enlist Harvard Law professor and historian Annette Gordon-Reed to give it more historical context. “There’s room for my earlier commentary, Mr. Reed’s take, the grand musical itself, and now a good faith effort to consider the musical’s subject in his real-world historical context — which is what the exhibit is designed to do,” Ms. Gordon-Reed told the AP. Meanwhile, Mr. Reed doesn’t believe Mr. Miranda’s musical can be salvaged, even with edits. “I think the corrective would be to close the show,” he said. The female co-hosts on ABC’s “The View” addressed Mr. Reed’s criticism during Thursday’s episode. “Hamilton was not a perfect human being by any stretch, and yet he’s depicted in that play as a great guy,” Joy Behar said. Ms. Hostin pleaded with Mr. Miranda to add another song to “Hamilton” that better addresses his past. These libtards harass Reps who attend their politically correct play, so who cares? The play is fiction. Read the book “Alexander Hamilton” by Ron Chernow. It is unbiased non-political biography, not the left wing interpretation by the playwright which liberals fawn over. You should realize, libtards HATE True biographies and anything “non-politicial”.. They feel they need to sink their accursed teeth into everything. I’ve never seen this, and give the liberties that it takes with American history, I don’t believe that I ever will. Hamilton did a few good things, but he is generally dismissed among the founding fathers because of his aristocratic tendencies. Imagine the direct opposite of Andrew Jackson. Hamilton didn’t have a populist bone in his body. What fame he has garnered was primarily due to his duel with my ancestor, Aaron Burr. The most believable reports are that Hamilton simply missed, Burr didn’t. Despite the portrayal in the Broadway musical, Aaron Burr was Caucasian. There doesn’t seem to be a lot places that Broadway show actually tells a true story. Yet they laughed at us, when we warned “Just you wait, now its the confederate generals they are going after. NEXT it will be our founders”. Once again we are proven right. 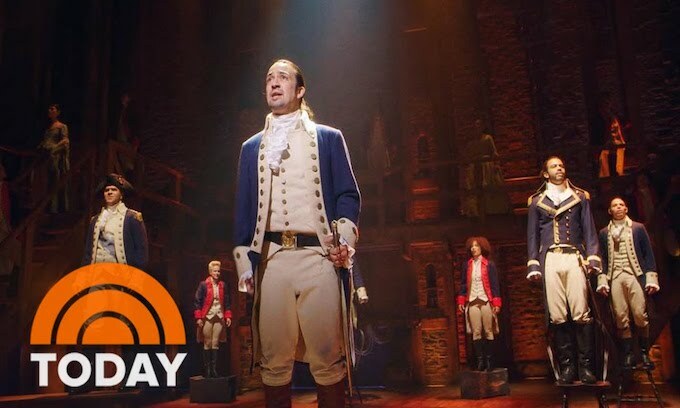 Unlike today when unrealistic unbelievable actual reality is more entertaining than fiction, in Hamilton’s time the writers and media actually had to invent their fiction of they wanted to be entertained. Hamilton indeed did not always get it right particularly since the age of Socialism had not yet been invented and he assumed the Constitution would be followed as written, not become a media imagined living changeable document by guys like Clinton and Obama would break the mold by ignoring it. Hamilton, for example, asserted (Federalist Paper #68): “The process of election affords a moral certainty, that the office of President will never fall to the lot of any man who is not in an eminent degree endowed with the requisite qualifications. Talents for low intrigue, and the little arts of popularity, may alone suffice to elevate a man to the first honors in a single State; but it will require other talents, and a different kind of merit, to establish him in the esteem and confidence of the whole Union, or of so considerable a portion of it as would be necessary to make him a successful candidate for the distinguished office of President of the United States. It will not be too strong to say, that there will be a constant probability of seeing the station filled by characters pre-eminent for ability and virtue…. we may safely pronounce, that the true test of a good government is its aptitude and tendency to produce a good administration.” Obviously since socialism, we have just produced bad government. It amazes me how liberals get on their self righteous haunches about past wrongs that today no one will question. But, they miserably fail… And, even are enthusiastically complicit in what is plainly in our sight. Late term abortion today is the darling of the liberal left. And will be seen as horribly more severe than slavery ever was. That is.. if our nation ever regains its sanity. As long as the leftists control our schools, i doubt we’d regain our national sanity. When will they be doing a play on the African Chiefs who sold captured combatants into slavery ? Let’s tell the WHOLE story, not just the Leftist politically expedient one. Hmm let me think. About when hell freezes over. Our founders were against slavery, they petitioned King George 2nd to end slavery but he refused.Remember leftist our founders lived under British law….which allowed slavery. Leftists would have to READ history to understand that.. The best musical depicting the founding fathers and the angst of addressing slavery is, and always will be 1776.